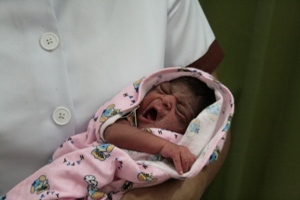 The new 48 bed maternity ward has transformed the lives of expectant mothers in Galle. The new facilities offer space, cleanliness and a relaxed atmosphere to help mothers with difficult pregnancies to have their babies. Sister, PA Sriyani says that the number of C-sections has reduced significantly because “the mothers are so relaxed and happy in the new ward”. The nurses are also very happy to be working in the new facilities which are much improved from the cramped and damaged post-tsunami wards they had to endure. The labour room attached to the maternity ward came into full operation in August 2012 and 478 babies have been born there between 8 August and 16 September. In fact, between 5am and 11am on Sunday 16 September there were 10 births.